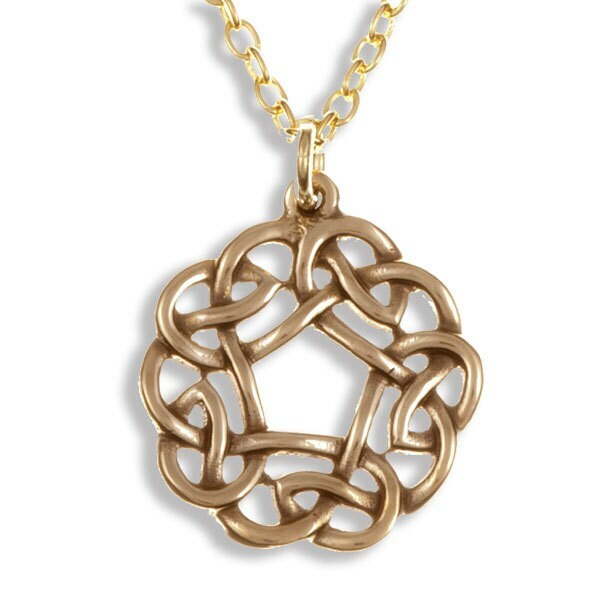 Bronze openwork Celtic pentagon knot pendant on gold-plated trace chain. MATCHING earring & brooches AVAILABLE under bronze section. This item comes with a lifetime guarantee. If there is a fault in the workmanship, we will repair or replace it free of charge. Gift ideal for : Wedding, Anniversary, Mother day ,Birthday, Anniversary, Christmas or just a treat . SHIP/DESPATCH FROM UK WITHIN 1-3 BUSINESS DAYS.